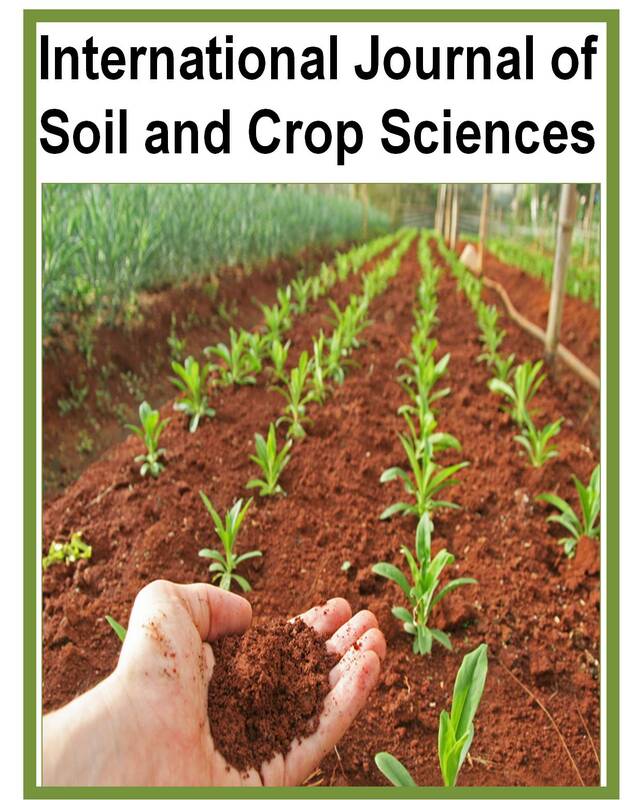 International Journal of Soil and Crop Sciences(IJSCS) welcomes the submission of manuscripts that meet the general criteria of significance and scientific excellence. Papers will be published about one month after approval. Electronic submission of manuscripts is strongly encouraged, provided that the text, tables, and figures are included in a single Microsoft Word file (preferably in Arial font). A cover letter with names, email addresses and affiliations of three possible reviewers as well as a declaration that the prospective manuscript is original and has not been published before nor is it under consideration for publication by another publisher. A manuscript number will be mailed to the corresponding author same day or within 72 hours. Authors are expected to write out their personal information in a cover letter that should include the corresponding author's full address and telephone/fax numbers and should be in an e-mail message sent to the Editor, with the file, whose name should begin with the first author's surname, as an attachment. The journal does not accept number citations in the body of the manuscript. All citations must be in-text citation or in-body citation, that is, cite the author’s name and the year of publication. Note that International Journal of Soil and Crop Scienceswill only accept manuscripts submitted as e-mail attachments. A Short Communication is suitable for recording the results of complete small investigations or giving details of new models or hypotheses, innovative methods, techniques or apparatus. The style of main sections need not conform to that of full-length papers. Short communications are 2 to 4 printed pages (about 6 to 12 manuscript pages) in length. These should describe original and carefully confirmed findings, and experimental procedures should be given in ample detail for others to verify the work. The length of a full paper should be the minimum required to describe and interpret the work clearly. The use of subheadings in the main body of the text is highly recommended. Submissions of reviews and perspectives covering topics of current interest are welcome and encouraged. Reviews should be concise and no longer than 4-6 printed pages (about 12 to 18 manuscript pages). Reviews are also peer-reviewed. All articles are reviewed by an editor and members of the Editorial Board or capable external reviewers. Decisions will be made as quickly as possible, and the journal try hard to return reviewers’ evaluations/comments to authors within 2 weeks. IJSCS publish accepted manuscripts within one month after submission. All portions of the manuscript must be typed double-spaced and all pages numbered starting from the title page. The Title should be a brief phrase describing the contents of the paper. The Title Page should include the authors' full names and affiliations, the name of the corresponding author along with phone, fax and E-mail information. Present addresses of authors should appear as a footnote. The Abstract or summary should be exciting, revealing and abundantly clear. It should briefly describe the topic, convey the scope of the research, specify significant data, and point out major findings and conclusions. The Abstract should be 100 to 200 words in length. Well constructed sentences, active verbs, and the third person should be used, and the abstract should be written in the past tense. Standard names should be used and abbreviations should be avoided. No work should be cited. Under the abstract, about 5 to 10 key words that will provide indexing references should be listed. A list of non-standard Abbreviations should be added. In general, non-standard abbreviations should be used only when the full term is very long and used often. Each abbreviation should be spelt out and introduced in parentheses the first time it is used in the text. Only recommended SI units should be used. The Introduction should provide a clear statement of the problem, the relevant literature on the subject, and the proposed approach or solution in such a manner that should be intelligible to scholars and researchers from a broad range of scientific disciplines. Materials and Methods should be complete enough to allow experiments to be reproduced. However, only truly novel procedures should be described in detail; earlier published procedures should be cited, and significant changes of published procedures should be mentioned briefly. Capitalize trade names and include the manufacturer's name and address. Subheadings should be used. Methods in general use need not be described in detail. Results should be presented with simplicity, clarity and precision. The results should be written in the past tense when describing findings in the authors' experiments. Previously published findings should be written in the present tense. Results should be explained, but basically without referring to the literature. Discussion, speculation and detailed interpretation of data should not be included in the Results but should be put into the Discussion section. The Discussion should interpret the findings in view of the results obtained in this and in past studies on this topic. State the conclusions in a few sentences at the end of the paper. The Results and Discussion sections can include subheadings, and when appropriate, both sections can be combined. The Acknowledgments of people, grants, funds, etc should be brief and concise. Tables should be kept to a minimum and be designed to be as uncomplicated as possible. Tables are to be typed double-spaced throughout, including headings and footnotes. Each table should be on a separate page, numbered one after the other in Arabic numerals and supplied with a heading and a legend. Tables should be self-explanatory and easy to comprehend without reference to the text. The details of the methods used in the experiments should preferably be described in the legend instead of in the text. The same data should not be presented in both table and graph form or repeated in the text. Figure legends should be typed in numerical order on a separate sheet. Graphics should be prepared using applications capable of generating high resolution GIF, TIFF, JPEG or PowerPoint before pasting in the Microsoft Word manuscript file. Tables should be prepared in Microsoft Word. Use Arabic numerals to designate figures and upper case letters for their parts (Figure 1). Begin each legend with a title and include sufficient description so that the figure is understandable without reading the text of the manuscript. Information given in legends should not be repeated in the text. References, Footnotes and Endnotes: In the text, a reference identified by means of an author‘s name should be followed by the date of the reference in parentheses. When there are more than two authors, only the first author‘s name should be mentioned, followed by ’et al‘. In the event that an author cited has had two or more works published during the same year, the reference, both in the text and in the reference list, should be identified by a lower case letter like ’a‘ and ’b‘ after the date to distinguish the works. Footnotes and Endnotes should be properly numbered to ensure uniformity and should be listed after the references. Several studies (Soenaryo, 2004; Lemeshow and Levy, 1999) showed that a minimum of two 24-hour recalls ….. in underfives. Lemeshow and Levy (1999) revealed that……. References should be listed at the end of the paper in alphabetical order. Articles in preparation or articles submitted for publication, unpublished observations, individual communications, etc. should not be included in the reference list but should only be mentioned in the article text (e.g., C.k. Palmer, University of Ibadan, Nigeria, individual communication). Journal names are abbreviated according to Chemical Abstracts. Authors are fully responsible for the accuracy of the references. Adams K.M., Kate Pedro D.K., and Dunca L.F. (2012). Perception and use of Information and Communication Technologies (ICTs), J. Libr. Sci. Res. 9, 165-174. Adams KM, Kate Pedro DK, Dunca LF (2012). Perception and use of Information and Communication Technologies (ICTs). J. Libr. Sci. Res. 9: 165-174. Gordons SK, Kampas FG, Gigs HD (2009). Impact of Language in Human Society. Am. J. Lang. Ling. 896(3): 449-563. Soenaryo, E. (2004). Food product development to optimize children growth and development: indofood Perspective. Proceeding on food and nutrition innovation for Optimizing Children Growth and Development. American Soybean Association, Jakarta. Soenaryo E (2004). Food product development to optimize children growth and development: Indofood Perspective. Proceeding on Food and Nutrition Innovation for Optimizing Children Growth and Development. American Soybean Association, Jakarta. Mokoro S., and Levy P. S. (1999). Sampling of Populations: Methods and Applications. 3rd edn. New York, US: John Wiley & Sons Inc, P. 18-19. Mokoro S, Levy PS (1999). Sampling of Populations: Methods and Applications. 3rd edn. New York, US: John Wiley & Sons Inc, pp. 18-19. Peters K., Kuittinen J., Duggan M.B., Briend A., Manary M., Wales J., Kulmala T., and Ashorn P. (2004). Supplementary feeding of underweight, stunted Malawian children with a ready-to-use food. Journal of Pediatrics, Gastroenterology and Nutrition, vol. 38, 152-158. Peters K, Kuittinen J, Duggan MB, Briend A, Manary M, Wales J, Kulmala T, Ashorn P. (2004). Supplementary feeding of underweight, stunted Malawian children with a ready-to-use food. J. Pediatr. Gastroenterol. Nutr. 38: 152-158. Eke P, et al., (2009). Comparative study on supplementation of potato flour biscuits on the nutritional and cognitive profile of the selected children. Iran Journal of Pediatrics, volume 19, pages 285-292. Eke P, Subramania A, Subramaniam P (2009). Comparative study on supplementation of potato flour biscuits on the nutritional and cognitive profile of the selected children. Iran J. Pediatr. 19: 285-292. Short Communications are limited to a maximum of two figures and one table. They should present a complete study that is more limited in scope than is found in full-length papers. The items of manuscript preparation listed above apply to Short Communications with the following differences: (1) Abstracts are limited to 100 words; (2) instead of a separate Materials and Methods section, experimental procedures may be incorporated into Figure Legends and Table footnotes; (3) Results and Discussion should be combined into a single section. Proofs and Reprints: Electronic proofs will be sent (e-mail attachment) to the corresponding author as a PDF file. Page proofs are considered to be the final version of the article. With the exception of typographical errors, no changes will be made in the manuscript at the proof stage. Since IJSCS articles will be published liberally online to attract a wide audience), authors will have free electronic access to the full text (in both HTML and PDF) of the article. Authors can freely download the PDF file from which they can print unlimited copies of their articles. Copyright: Submission of an article is done with the understanding that the article has not been published before (except in the form of an abstract or as part of a published lecture, or thesis) that it is not under consideration for publication somewhere else; that if and when the article is accepted for publication, the authors consent to automatic transfer of the copyright to the publisher. Fees and Charges: Authors are required to pay a $350 handling fee. Publication of an article in Global Research Journal of Fishery Science and Aquacultureis not contingent upon the author's ability to pay the charges. Neither is acceptance to pay the handling fee a guarantee that the manuscript will be accepted for publication. Authors may still request (in advance) that the editorial office waive some of the processing fee under special circumstances. However, there are no submission charges. Authors are required to make payment ONLY after their manuscript has been accepted for publication.